Friday. 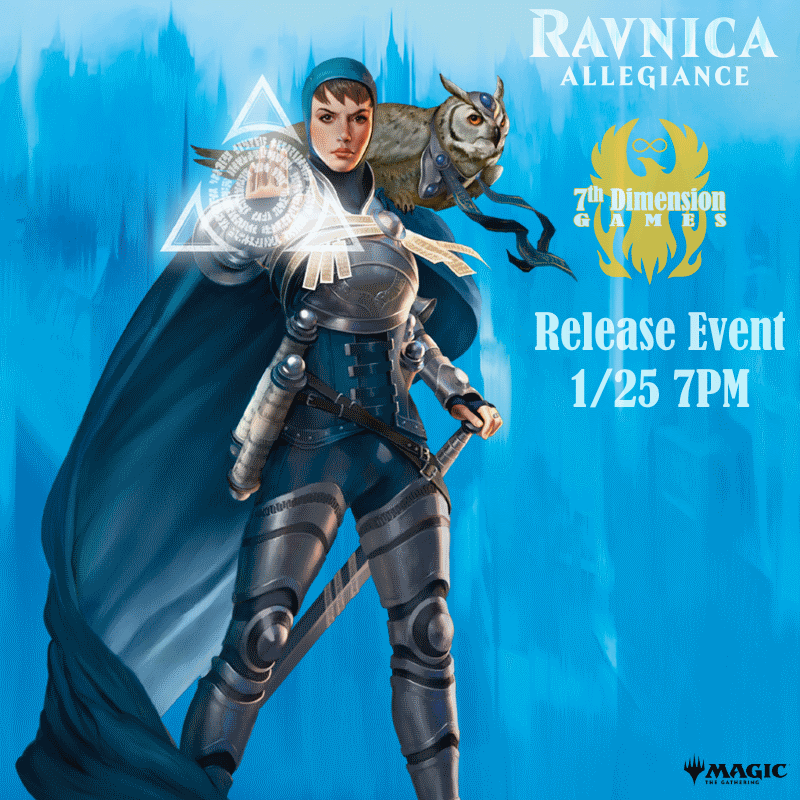 January 25th, at 7PM is the release event for Ravnica Allegiance. We will be running a sealed event with prerelease packs. Packs will be given out at random. If 8 people are interested, we will also run a draft. Starting Monday January 28th and lasting 4 weeks will be our Monday night Magic League for Guilds of Ravnica. Playing 10 games in the League gets you a copy of Gate Colossus! On Sundays at 1PM, starting February 3rd, we will be holding Standard Showdown. In addition to our standard prizing, we will be giving away 6 Standard Showdown packs. Each pack contains two standard legal rares, a special foil land and a randomly selected foil card. 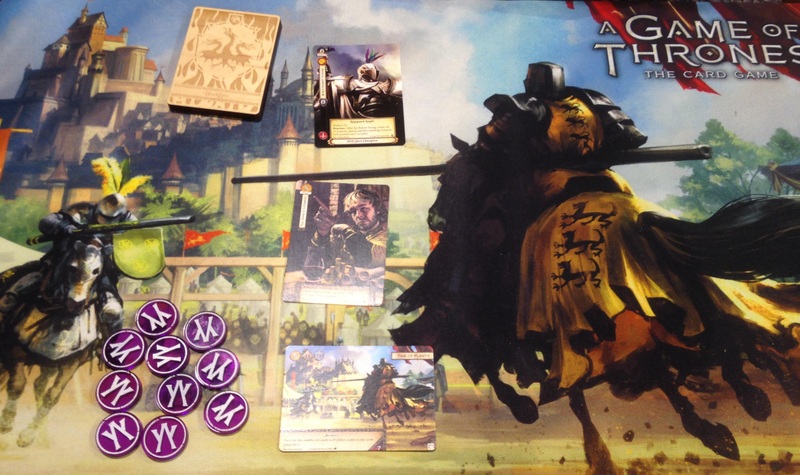 January 26th, at 1PM, we will be hosting our Game of Thrones Living Card Game Store Championship Tournament. Bring a joust deck and a good strategy to win a buy at Regionals, an alternate art Ser Robert Strong and one of the top four playmats. Sunday, January 27th, starting at noon, we will be hosting Savage Sunday. 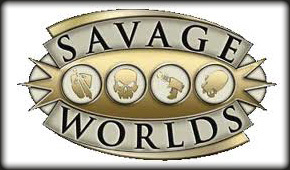 Come out and play a game of the Savage Worlds RPG! Novice and Veteran players alike are welcome. We have up to 5 Game Masters available, shoot us a note, or register on the Facebook event if you plan on coming. All D&D 7 Die Polyhedral sets – Buy One Get One Free!! Christmas Eve we will be open 12-4. Christmas Day we will be closed. All other days are our normal hours. Saturday & Sunday, January 19 & 20th, is Prerelease! 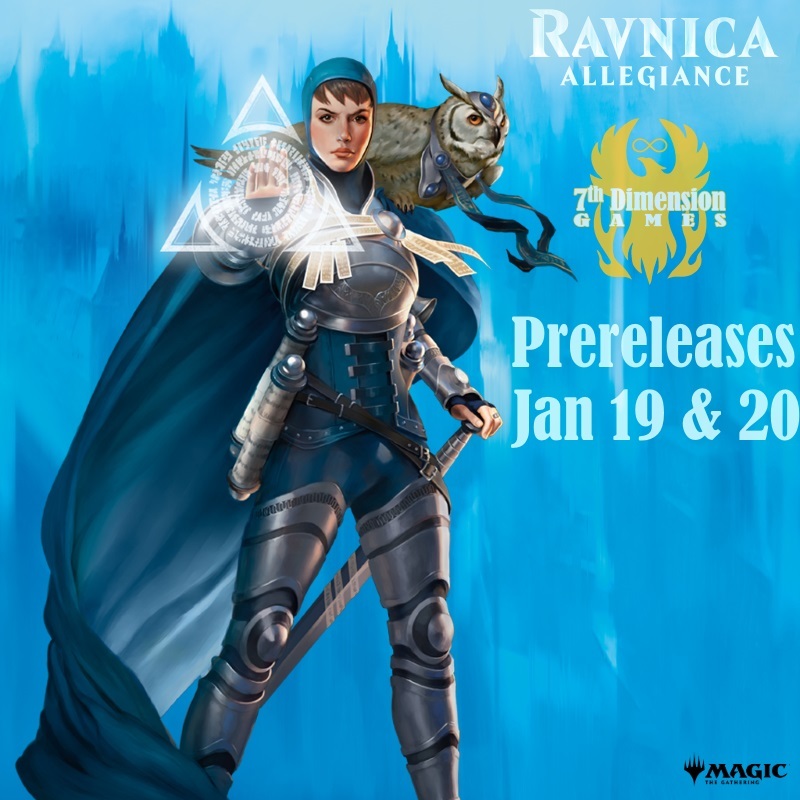 Ravnica Allegiance, a rare card from the set which is foil with the date stamped on it, a spin down die and a pack that contains only cards from your chosen Guild. From those packs they must construct a deck and play in the tournament. Guild choice goes to players that sign up first. Sign up is $30 per player per event. Sunday at noon we’ll be running 5 rounds, you must go 3-2 or better to win packs. The other 4 events will be our flat payout of 1 prize pack per round won. Two headed Giant will be a 3 round event – everyone gets a prize pack, and 1 additional prize pack per player per round won. Players that pay at least a week in advance get a free pack of sleeves when they arrive for the event. Learn about Magic the Gathering! 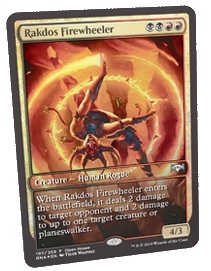 Get a free Rakdos Firewheeler if you are, or if you play, a new player! Saturday January 12th, at 1 PM. This will be a 3 round event with narrative scenarios for each round. Standard army build rules and only 1 army list. We were a little slow scheduling this, but we are pleased to announce: Jan 5, 2019 at 1 PM, we will be running the X-Wing Wave Championship! Buy one Unlock and/or Exit game, take half off your second one! Plus we have a limited number of secret envelopes left. Spend $70 to get one while supplies last! Lastly, we have two extra hoodies – one size 3X and one XL for sale.